Success Principles: Claim It If You Earned It! 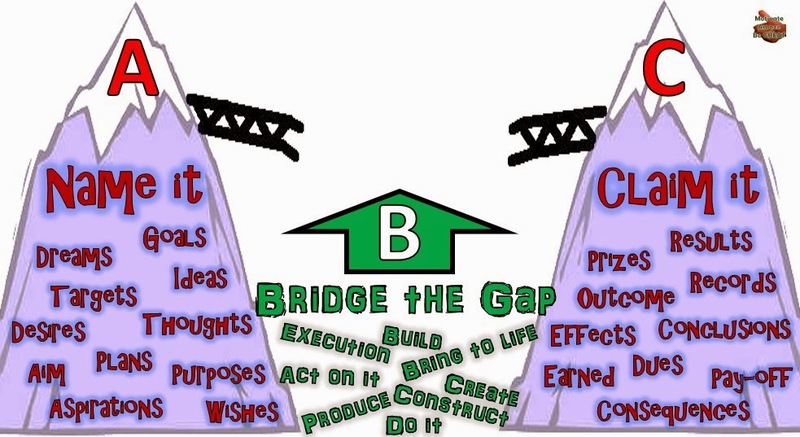 Bridge The Gap - Motivate Amaze Be GREAT: The Motivation and Inspiration for Self-Improvement you need! To name it (A) and to claim it (C) are two different things, but are composed of the same things. C. you claim what you wanted. That's the basic process (ABC) of getting the results you want. The road to success: first enlist your objectives and targets - you name it; second - bring into existence what you have planned - bridge the gap; finally - demand what is your by right - you claim it! Claim It If You Earned It! They just claim, claim and claim for something that they haven't earned the rights to. They claim it but never name it. Actually, claiming it should be to demand or ask for something as rightful or due. That's right, should be...but the claimers we talk about don't pay their dues, they don't work hard to achieve something, they just demand it without having done the work for it. Unfortunately, claimers represent the majority of people in todays society. They just dream, dream and dream for something that they never actually do. They name it but never bridge the gap in order to claim. Dreaming it's a good thing, if... you have the ability to turn those dreams into reality. Another good thing about dreams, is that you can dream about anything, dream job, dream car, dream house, dream travel, you name it! That's right you name it! But people get addicted to dreaming because it's a never ending world, anything is dreamable, so they dream so much that's quite impossible to achieve all those dreams. The results: they don't know what dream to choose from that immensity, so they never work on one specific dream, they never achieve any. They love to name it. Unfortunately, there are many dreamers and dreams in this world they never saw daylight. They just achieve, achieve and achieve things they have worked hard for. They name it, they execute, and then they claim it. Achieving it's the ultimate feeling, you dream something in your mind, you create something real with it, and then you take the reward from it. What a feeling! They name it, they work for it, they claim it, in the real sense of claiming! They demand for what they have the rights to. Unfortunately these people are rare to find. Two concepts you should retain: Bridging the gap (1) and Paying your dues (2). (1) Bridging the gap: To make the connection between two things that need to be connected. Connect the "you name it" with "you claim it" with execution. If you bridge the gap, paying your dues will be no problem! So who are you? A Claimer? A Dreamer? Or a Achiever? What are you willing to be? A Claimer? A Dreamer? Or a Achiever?